1I. de Miguel (e-mail: ignacio.miguel@tel.uva.es) and R. J. Durán (e-mail: ramon.duran@tel.uva.es) are with the Department of Signal Theory, Communications and Telematics Engineering, Universidad de Valladolid, Campus Miguel Delibes, 47011 Valladolid, Spain. 2R. Vallejos (e-mail: reinaldo.vallejos@usm.cl) and A. Beghelli (e-mail: alejandra.beghelli@usm.cl) are with the Telematics Group, Electronic Engineering Department, Universidad Técnica Federico Santa María, Valparaíso, Chile. 3A. 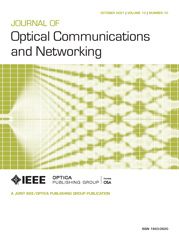 Beghelli is also with the Optical Networks Group, Electronic & Electric Engineering Department, University College London, UK. The dynamic operation of WDM networks might lead to significant wavelength savings, when compared with their static counterpart, at the expense of facing nonzero blocking probability. Hence, efficient dimensioning (i.e., determining each link capacity) and control methods are required to operate these networks. Typically, the dimensioning of WDM networks is carried out only after the routing algorithm has been defined. However, this way of designing the network might result in inefficient solutions in terms of wavelength requirements. We propose a novel genetic algorithm to solve the joint routing and dimensioning problem in dynamic WDM networks, with the aim of obtaining a network cost close to minimum while guaranteeing an upper bound on the blocking probability. Used prior to network operation, the algorithm determines which route should be used for each potential connection and also dimensions the number of wavelengths re quired in each link. The efficiency of the algorithm is validated in ring and mesh topologies, providing wavelength savings of up to 17% when compared with the best existing algorithm to date. Moreover, since the routes provided by the genetic algorithm are stored in routing tables, it also ensures extremely fast on-line network operation. a Bold characters represent those cases where GARD outperforms BR-AD. * The * ILP formulation solver was stopped after 20 h computing time, and the best result, but not necessarily optimal, is shown. a Each value represents the total time required for the three executions of the genetic algorithm to get the solution for one traffic load. Results are shown in mean with 95% confidence intervals.